Road Runner Moving and Storage is committed to environmental sustainability and has incorporated several new Green Initiatives starting in 2019. This includes becoming the leading corporate partner of the Alabama Urban Forestry Association and helping the Alabama Re-Leaf Program plant large trees in schools and parks across Alabama. With the help of Road Runner Moving, the Alabama Re-Leaf Program has planted more than 44,000 trees throughout the state in the past nine years. Homewood, Alabama Mayor Scott McBrayer (left) and Road Runner Moving CEO Chase Carlisle (right) at Hall Kent Elementary School on November 27, 2018. Deer Valley Elementary School second grade students planting Christmas Trees with AUFA volunteers, Hoover City Forester Colin Connor, and Road Runner Moving on January 19, 2018. Our organization understands the importance of preserving our natural resources for future generations to come. That is why our organization has pledged to plant a variety of trees in schools across the communities we serve by working with city foresters and other key city officials. 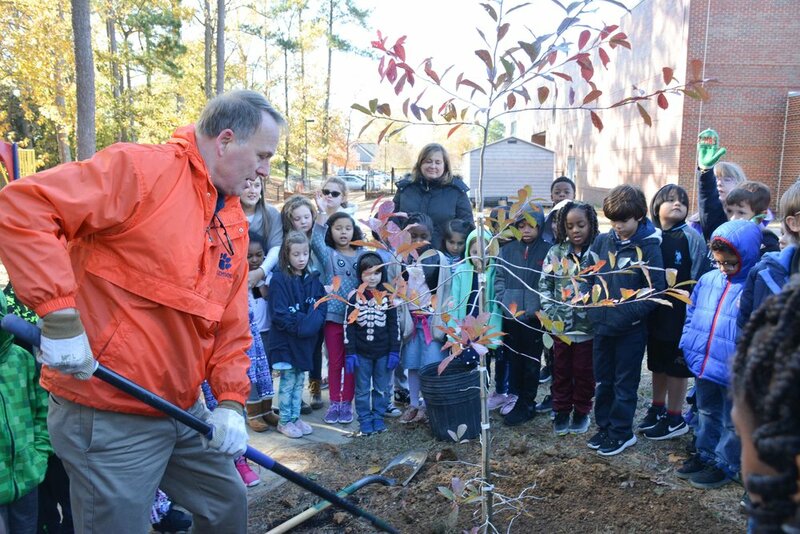 In January we started planting trees in the Hoover City School System followed by plantings across elementary schools in Homewood City Schools. We are actively working to plant trees in Mountain Brook, Vestavia, Alabaster, Pelham and other Birmingham area city school systems as well as projects in Huntsville and Mobile, once more projects are approved and fully funded. With the help of Road Runner Moving, the Alabama Re-Leaf Program has planted more than 44,000 trees throughout the state in the past nine years. 100% of charitable donations go directly to planting trees through our partnership with the Alabama Urban Forestry Association’s “Re-Leaf Program” which is a 501c-3 non-profit organization. Plus, Road Runner will match your donation dollar for dollar in each calendar year! Alabama Re-Leaf is a charitable program designed to help plant trees across the state to clean the air, mitigate flooding and beautify communities. When your in the moving business, one of your biggest assets is your team's fleet. That is why started converting from the traditional delivery fleet vehicles to a more environmentally friendly alternative. This lead us to the purchase of our first hybrid electric fleet vehicle. The GMC Yukon Hybrid was converted to a hybrid fleet vehicle similar to what the NYPD implemented several years ago and is estimated to reduce approximately 40% of our fuel consumption vs the traditional work truck. Additionally, our entire fleet of moving trucks are brand new, consisting of 2017-2019 year model trucks meeting the cleanest emissions systems available on the market.